The plutonites Granite and Granodiorite rocks is not so far from metamorphism . The Granite group compound about 44% of the continental plutonic rocks. We clasified like igneous by composition of dark and clear minerals in the Q-A-P-F Streckeisen table filled in the 3rth and 4rth fields. But the transition from Gneises and Migmatites make doubt in the past about the correct classification between igneous or methamorphic . When the minerals melt we talk about palingenesis process and when It´s result of an ingreasing metamorphism we prefer the granitization theory. But is still not easy to discriminate the apropiate origin without another considerations. Moreover is not so uncommon to find xenolites included. 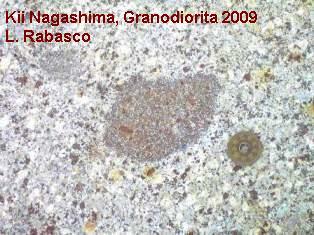 The palingenetic granites usually are contaminated from magmatic chamber rocks but in the caso of granitization is better to talk about “inclusions” from the pre-existing sedimentary or metamorphic rocks. Like in these picture, sowing the coagulums and how the metamorphism cant to restructured all the primogeneous inclusions of sedimentary rocks. These xenolites make Granite inhomegeous.